We recently showed you how to make Punjabi Masala (in bulk). 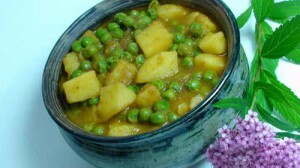 Here is a super fast Indian recipe for Aloo Matar (Potaotes with Green Peas) you can make using your pre-made masala. Let your imagination run wild…substitute any vegetable and create yet another delicious variation. 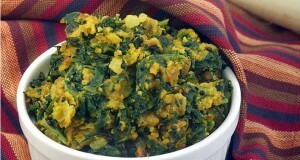 Add Turmeric Powder and Punjabi Masala. Mix well. Add Potatoes and stir to coat masala. Add Salt, Red Chili Powder, Chaat Masala and Water. Mix well. Close pressure cooker and cook until 1 whistle sounds. Turn off stove and allow the pressure from the cooker to come down. Open pressure cooker and add Green Peas. Adjust salt and other spices as necessary. 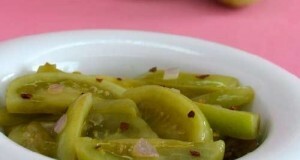 Cook until Green Peas are no longer raw. 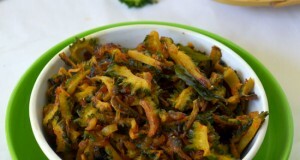 Garnish with cilantro and serve with chapati or rice. 1. Less water can be added if you don’t require a lot of gravy. 2. The same preparation can be done without a pressure cooker. Cooking time may be longer.